Benefits of Molded Pulp - Henry Molded Products Inc. The benefits of molded pulp fiber are numerous. At Henry Molded Products, we pride ourselves on being a leader in environmentally-conscious packaging solutions. 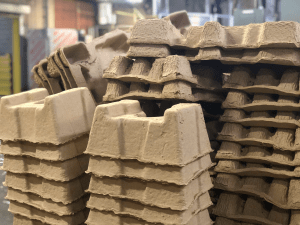 Our molded pulp fiber packaging and containers are manufactured from recycled pre- and post-consumer newsprint, Kraft paper, and other selected waste papers. We engineer our products to provide superior cushion while remaining plyable and recyclable.